Oral Surgeon, James Huang practices a full scope of oral and maxillofacial surgery. When you find out you need some type of oral surgery, it can sound daunting and perhaps scary, but it doesn’t need to be. At All In One Dental Innovations, you are in caring, professional hands that know the absolute importance of a gentle touch and careful approach–especially when it comes to surgeries of the mouth. Dr. Huang’s expertise and oral surgical skill can minimize the invasiveness and aftercare of a surgery. We will always make sure you are comfortable during the procedure and prepared for a smooth period of recovery. If oral surgery has become necessary, our Dublin dental clinic has you covered with a number of procedures that can fix a range of concerns. Dr. Huang is highly skilled and well-experienced in the procedures that we offer including tooth extractions, dental implants, sinus augmentation, and bone grafting. When faced with the need for oral surgery, know that with us you are in the best, most caring hands. In cases of severe decay, breakage, or missing teeth, dental implants can offer a beautifully permanent restoration solution. Attempting to keep your natural teeth in place is our first priority and we always aim for this goal when possible. However, sometimes a tooth has already fallen out or has reached a point where decay or breakage has rendered it beyond saving. When this does happen, dental implants are a saving grace. Having severely decayed, broken, or missing teeth can greatly impact your oral health and appearance in various ways, fortunately, we do have a solution. The dental implant itself refers to the strong metal anchor that acts as a root for an artificial tooth, bridge, or denture. Dental implants may replace one tooth or multiple teeth. 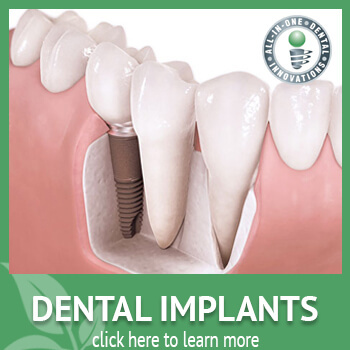 The fantastic thing about permanent dental implants is how closely they will resemble, feel, and act as real teeth. There is never need for removal and you can care for your dental implants just as you would for natural teeth. Missing or badly decayed teeth can negatively affect both your health and appearance. When one tooth is unhealthy, your gums and neighboring teeth burden the added strain from chewing and lack of proper tension between teeth (which can be problematic even when your mouth is at rest). Furthermore, unchecked decay and strain can begin to affect the bones of the mouth where your teeth are rooted in place. Dental implants can fix troublesome teeth as well as prevent the need for further restorations or more serious health concerns or necessary surgeries. 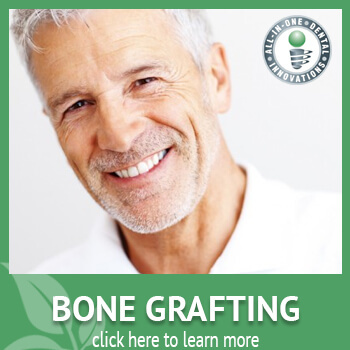 Dental bone grafting is a surgical procedure that may be necessary for a few different reasons, but ultimately the goal is to strengthen and reinforce the bones of your mouth where your teeth or dental implants are rooted. Weakening or loss of bone mass in this area can cause noticeable oral health and appearance-related issues from pain and discomfort to loss of teeth and sagging skin around the mouth due to a lack of proper dental and skeletal support. In severe cases of bone loss that have progressed past a certain point, more serious problems may surface including damage to the bone structure of the face or the spread of disease to other parts of the body. Appearance aside, bone loss can be detrimental to your oral and overall health. We take signs of bone loss or potential bone loss very seriously and make strides to prevent it before it can happen. One way we can do this is to perform a small bone graft procedure when oral health has diminished and teeth require extraction. By taking these steps with a smaller grafting procedure in the socket of extracted teeth, it can not only allow for support of dental implants but can also prevent the potential need for a larger and more serious dental bone grafting surgery in the future. When it comes to any type of oral surgery, an extremely careful hand and skillful expertise are absolutely vital. Dr. Huang has a glowing reputation for impeccable work. At All-in-One Dental, our patients always receive the absolute best in surgical skill and gentle care. A sinus lift (also known as a sinus augmentation) is a type of oral surgery that is performed if there are issues discovered with the bones of the upper jaw or maxillary sinuses when preparing for dental implants. The process of a sinus lift involves adding bone to the upper jaw to create a foundation suitable for the insertion of implants. In order to place dental implants in the upper jaw, there needs to be a strong, sizeable foundation. The maxillary sinuses are paranasal sinuses located on either side of the nose that run from below the eyes to just above the mouth. In more specific terms, the floors of each of these two paranasal spaces end right above the roots of the first and second upper molars. 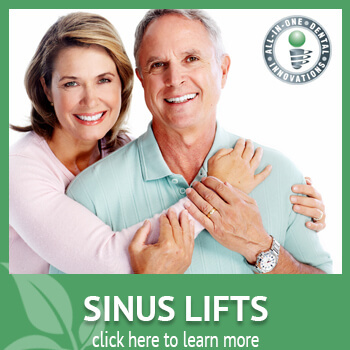 A sinus lift can eliminate this problem. The procedure may also be employed if there has been bone loss in the upper jaw due to advanced decay, missing teeth, or gum disease. A sinus lift can be quite detailed and a meticulous hand is needed to perform this surgical procedure with great success. Dr. Huang’s masterful surgical skill and years of experience is able to offer his patients flawless results. At All In One Dental, we always aim to keep natural teeth in place when facing a dental concern that faces possible tooth extraction as a solution. 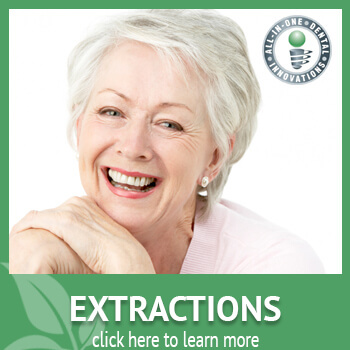 Some issues that may lead to the need for extraction include advanced decay, extensive damage, infected tooth roots, and gum disease. While these problems may be solved by other solutions when handled early on, after a certain point tooth extraction may become inevitable. Dr. Huang may also look to tooth extraction for other reasons such as impacted wisdom teeth or overcrowding of other teeth due to other causes. Pressure or discomfort in any of the four molar areas of the mouth can be an indicator of incoming wisdom teeth. Always be sure to make an appointment with us if you are experiencing oral discomfort of any kind. Regardless of your individual circumstances, Dr. Huang’s highly skilled expertise always makes for a smoother tooth extraction and a shorter, easier recovery time. If you have recently had a tooth extracted, be sure to follow the instructions given for any special aftercare that may be required. Following your dentist’s advice can ensure a successful recovery without additional problems.